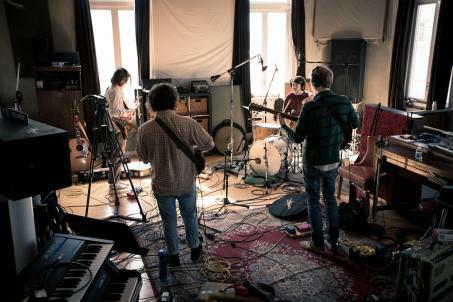 Hot on the heels of signing with Mississippi-based label Fat Possum Records, The Districts have released an eponymous five-song EP. Bookending the record are a pair of new tracks, “Rocking Chair” and “Stay Open,” produced by Bill Moriarty, with three standouts from their self-released LP Telephone - “Lyla,” “Funeral Beds,” and “Long Distance” - sandwiched in between. A swirling guitar pattern punctuated by a touch of percussion lays the foundation for Rob Grote’s vocals in “Rocking Chair,” which are delivered at a quick-hitting yet evolving pace. The guitars and percussion build a rolling tempo, before slowing as Grote momentarily admits, “If I drink some more, well, I think I might drown. Slip into silence as my heart it burns out. Find the devil inside me, and I nail him back down,” capped by a collective exuberant “whew” setting off an abbreviated example of the quartet’s foot-stomping instrumentation. Then, the lyrics take a prophetic twist as Grote emotively utters, “If the devil ever comes around, shiver at the sight…” returning to the collective chorus “Things ain’t what they used to be…” ramping up into an elongated energetic instrumental display including unleashed guitar runs. “Long Distance” is a slow-burning blues rocker with a ringing guitar that relates the yearning of separated lovers. Grote introspectively opens up offering heartfelt lyrics - “Give me a minute or two to control myself, a minute to get back down to where you are. I just want to come down, and I just want to get back down,to see what this face really means to me.” He continuously pushes the envelope, pulling the heartstrings until they appear ready to snap, questioning, “Long distance, slow time - is it easier?” - ultimately unloading aggression into an instrumental assault before bouncing back to lead the group in an anthem-like sing-along conclusion. 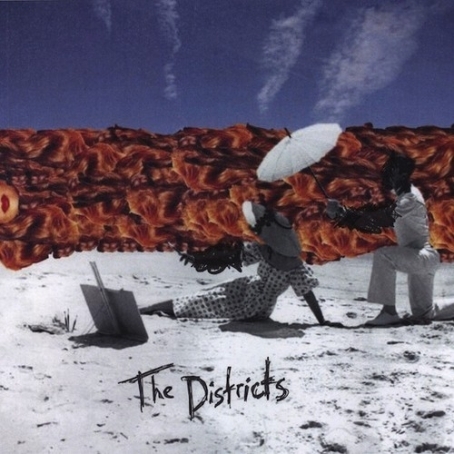 The Districts' snowball continues to get bigger as it's pushed up the steep slope of the music industry, and deservedly so. (Sorry, we couldn't help it, being surrounded by all this snow.) If you've caught the band live, then you've definitely taken notice of Rob Grote's impassioned, guttural vocal delivery and foot-stompin' intensity. We also really dig Mark Larson's poised guitar work. Well, the group polished off a few older tunes from Telephone and revealed a couple of new ones on their label debut that don't show any signs of the momentum lessening any time soon for the youthful crew. You can stream their splendid self-titled EP over at Rolling Stone. Enjoy! 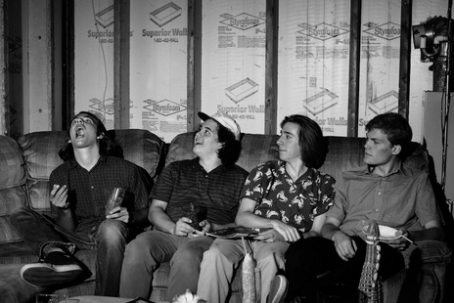 Check out the latest episode of Weathervane Music's Shaking Through featuring The Districts! The teenagers have a bright future ahead of them; having recently signed to Fat Possum, they're self-titled EP is scheduled for release on January 28. You can learn more about the group below while viewing the recording of their new track called "Vermont," which can also be downloaded for free HERE. Fat Possum just announce that The Districts’ new self-titled EP will be released on January 28 (in North America and January 27 in Europe). Below is its first single, a remastered version of “Funeral Beds.” Our readers should already be familiar with the song since it originally appeared on the band’s 2012 LP Telephone and was featured in their viral in-studio performance video with our friends/collaborators HotBox Studios. “Lyla” and “Long Distance” from Telephone have also been remastered, and will be on the Fat Possum release alongside two brand new tracks, “Rocking Chair” and “Stay Open,” which were recorded at Waking Studio this past summer with producer Bill Moriarty. The band will be hitting the road this February/March with Austin's White Denim, and are scheduled to make a stop in Philly on Thursday, February 27 at Union Transfer.